The audio book for this is so flipping good, easy to see why it won the Odyssey. It gives great characterization for the story, I don't think I would have enjoyed this as much if I'd just simply read it. Castle Ghost has always been made fun of because of his first name, so he goes by Ghost. He lives in a rough neighbor and is afraid to tell his classmates. His coach gives him a second chance when he retaliates once again in school by having him join the track team. Little does Ghost know, its about to open a ton of new opportunities for him. What a great theme. 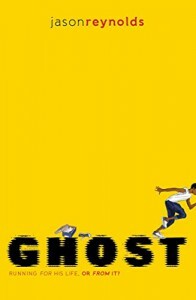 Ghost is such a relatable character to kids now a days, growing up in a rough neighborhood, having a weird name, having trouble in school, etc. etc. Reynolds is a master at children's literature and I fully enjoyed listening to this one.